Did you notice the cute little style touch Kate Middleton added to her ensemble a couple of weeks ago? We're totally stealing it for our Christmas Eve look! Kate Middleton went out on her royal business a couple of weeks ago wearing a maroon skirt and top the same day as her sister-in-law Meghan Markle went out on her royal business wearing a maroon dress and matching coat. Clearly, the two do not advise each other on style matters. Why would they, I suppose, when they have staff to do it for them? Still, I bet the royal stylists will be keeping a closer eye on each other's schedules in the future. Maroon is an 'it' colour at this time of year, though, so it's no real surprise Meghan and Kate both wore the shade on the same day. What it really highlighted, was their difference in style. Meghan's Club Monaco dress is probably the more coveted because it's a flattering style and can be worn multiple different ways. Kate, on the other hand, wore a two-piece, a flared skirt and jacket over a black turtleneck. Like Meghan, she wore black tights but she wore sensible work shoes, not boots. While I like a good two-piece and am all about the polo neck, I don't like the outfit. It reminds me of something my parents would have forced me into for Christmas family reunion when I was 11. However, Kate added a little unexpected twist that not a lot of people caught, and that is what we are copying for those Christmas occasions when we want to look a bit cute. It is, admittedly, a little Fifth Class, but we love it! 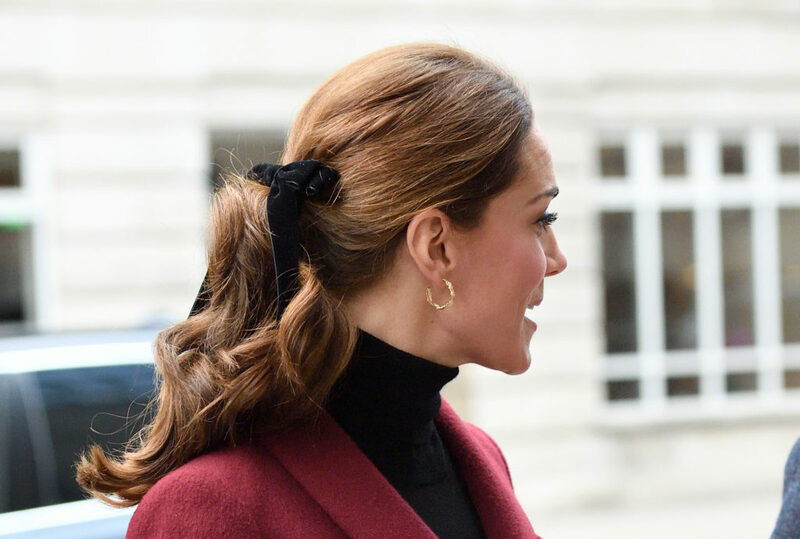 Hair accessories have made a big comeback of late, and Kate's velvet hair ribbon is a joy for your mane. I love the way it's been styled, with wavy hair and gold earrings. It's simple but lovely, and we'll be wearing something similar for our Christmas Eve cocktail party. Do you think Kate's velvet ribbon trend will catch on? Are you tempted to tie one in your hair over the festive season?